The best time to move most trees and large shrubs is in the fall and winter – during the main dormant season. In general, tree balls should be 9-10” in diameter for every inch of trunk caliper measured about 12” off the ground. If the plant is multi-trunked, use all the diameter of the largest trunk and half the diameter of all the others. The depth of the ball is not crucial, but is usually about half as deep as the ball is wide. The depth of the hole is important. It should be just less than the depth of the rootball, so that the ball when set is slightly higher than ground grade. This allows for settling and makes sure the ball isn’t too deep in the ground. As with new trees, excess soil should be removed to expose the root flare and to find the true top of the ball before establishing these dimensions. top of the root ball prior to planting. 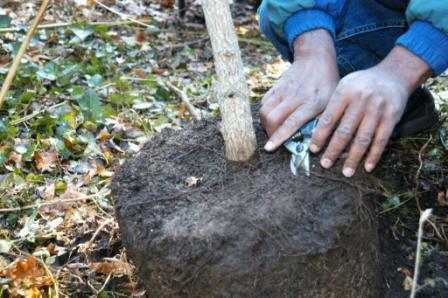 Burlapping the root ball prior to moving is not essential but helps to hold the soil together. It should always be removed at least from the top of the ball before backfilling with the native soil dug from the hole. Soak the backfill with water from a slow running garden hose and add an ounce of Garrett Juice per cubic foot of backfill. Do not thin out the top, stake the tree or wrap the trunk. Tree Planting Diagram. Root flare properly exposed at planting. Apply no more than two inches of mulch around newly planted or transplanted trees and shrubs and keep the mulch a few inches away from plant crowns. 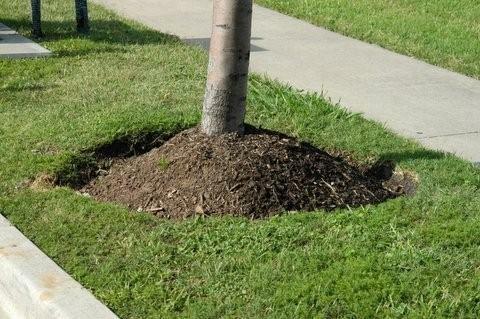 Do not pile mulch up in deep cone-shaped mounds around tree trunks. This looks bad, holds moisture against trunks and potentially leads to crown and stem rots. 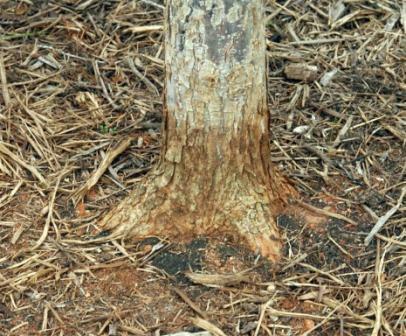 Extend mulch out one to two feet beyond the planting hole to allow for the season’s root growth for trees. Video.